This week on Star Maker Machine, our theme is Public Domain. So a lot of our posts are traditional songs. In thinking of what to post, my mind naturally lighted on songs that should have been traditional, but aren’t. Fields of Gold by Sting is a perfect example of what I mean. The structure of the lyric follows the model of many folk songs from the British Isles. 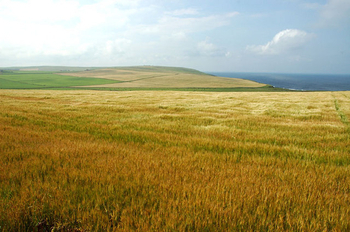 A line of verse is followed by a line of the first refrain, ending with the words ”fields of barley”. There is another line of verse, followed by the words of the second refrain, ending with “fields of gold”. This same structure is used, for example, in the traditional song Cruel Sister, and there are many others. Fields of Gold sounds like a traditional melody, and Sting has even left in part of the uillean pipes part. I hear in my head an arrangement for those pipes, Celtic harp, and voice. I remember when I first heard the song that I tried to find a recording with the traditional arrangement. Of course, there wasn’t one, and I think there still isn’t. The song was written by Sting, and this is the original recording. Still, if anyone knows of a recording of it with something like the arrangement I mentioned, or if you have done such an arrangement, please let me know in the comments.